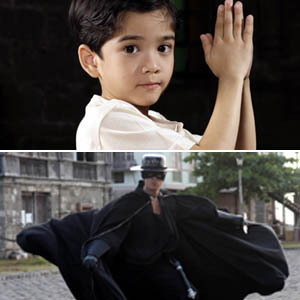 ABS-CBN's May Bukas Pa (above) and GMA-7's Zorro (below) topped AGB Nielsen Phils. ratings among Total Urban Luzon TV households from June 7-27, 2009. PEP (Philippine Entertainment Portal) was able to get a copy of the weekly Top 30 programs based on the survey of AGB Nielsen Phils. among Total Urban Luzon TV households from June 7 to 27. ABS-CBN's family drama May Bukas Pa topped the survey for the June 7-13 and June 21-27 periods, while GMA-7 action-fantaserye Zorro came on top for the June 14-20 period. For the June 7-13 period, 18 out of the Top 30 programs were from GMA-7, while 11 were from ABS-CBN and one from TV5. For the June 14-20 and June 21-27 periods, 17 were from the Kapuso network, 12 were from the Kapamilya network, and one from TV5. Coming in second for the June 7-13 period after May Bukas Pa (33.1 percent) was Only You with an average channel rating of 30.9 percent, followed by Kapuso Mo, Jessica Soho (30.8 percent), Zorro (30.6 percent), and Tayong Dalawa (30 percent). Completing the Top 10 were 24 Oras (28.1 percent), Totoy Bato (27.7 percent), TV Patrol World (26.6 percent), Dapat Ka Bang Mahalin? (26.3 percent), and Rated K (26.2 percent). For the June 14-20 period, May Bukas Pa (29.8 percent) came in second behind Zorro's 30.5 percent. These were followed by 24 Oras (29.7 percent), Tayong Dalawa (28.8 percent), and the last week of Dapat Ka Bang Mahalin? (28.6 percent). Occupying the rest of the Top 10 were the following programs: Kapuso Mo, Jessica Soho (28.3 percent), Only You (27.6 percent), Totoy Bato (26.9 percent), Kap's Amazing Stories (26.1 percent), and TV Patrol World (25.6 percent). Kapuso Mo, Jessica Soho climbed to second spot for the June 21-27 period with 30.6 percent, behind May Bukas Pa's 31.6 percent. Zorro and Tayong Dalawa tied for third and fourth place with an identical 30.4 percent rating. Only You came in fifth with 29.5 percent. The rest of the Top 10 programs were occupied by the following: 24 Oras (28.7 percent), Totoy Bato (28 percent), TV Patrol World (27.7 percent), Imbestigador (25.4 percent), and Bitoy's Funniest Videos (24.4 percent). In terms of channel rating and audience share, GMA-7 was slightly ahead over ABS-CBN. For the June 7-13 period, the Kapuso network had an average household rating of 16.1 percent versus Kapamilya network's 14.5 percent, or a 1.6 percent difference. GMA-7 had an average audience share of 38.2 percent against ABS-CBN's 34.3 percent, or a 3.9 percent difference. For the June 14-20 period, GMA-7 had an average household rating of 16.5 percent versus ABS-CBN's 13.7 percent, or a 2.8 percent difference. The audience rating of GMA-7 was 39.5 percent vs. ABS-CBN's 33 percent, or a difference of 6.5 percent. Finally, for the June 21-27 period, GMA-7 had an average 16.2 percent household rating compared to ABS-CBN's 14.5 percent, or a 1.7 percent difference. The Kapuso network's audience share was 38.2 percent against the Kapamilya network's 34.3 percent, or a 3.9 percent difference.